For many people the sole function of a bath faucet is to fill the bath. 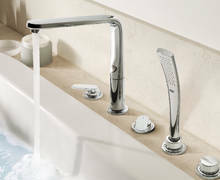 Others will require a faucet that can also control an over-bath shower (bath/shower mixers), allowing the user to divert the water between the bath faucet and the shower. Available with or without a thermostat, bath/shower mixers are the simplest way of showering over the bath. They can either be exposed or built-in. A diverter valve allows the user to switch between bath filling and showering. For safety and comfort it is always best to choose a model with a thermostat. These are designed to be mounted either on the rim of the bath or a tiled bath surround – ensure you choose the right product according to your situation. For the latter the spout needs to reach over the edge of the bath. Available in three-hole, four-hole and five-hole typologies, they combine a bath spout and a handshower. 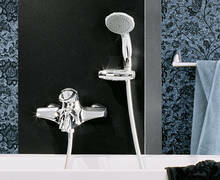 One or two handles or levers control the water and a diverter enables you to switch between the shower and the bath. 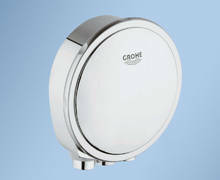 These are mounted inside the bath and act as a water inlet, overflow and pop-up waste control. 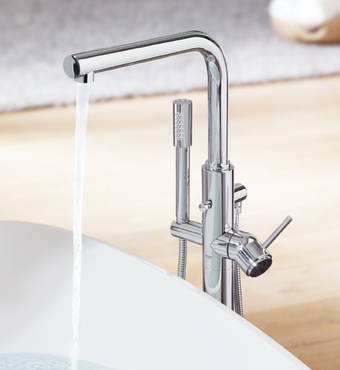 Created for use with freestanding baths, floor-mounted faucets feature pipe work from the floor in the same style and finish as the faucet itself. Many models are supplemented with a handshower.